We spoke wth Matt Tumbleson, CEO and founder of customer service platform Teckst, about the hierarchy of customer experience. Q: You say marketers are straying too far from the human touch in their approach to customer experience and need to put their customers at the forefront. A: While some would say we’re in a technology renaissance, I believe it’s time we distinguish the difference between a fad and accept that all the technology in the world won’t help make something already bad any better. We need to get back to basics and do a few things great before layering on new things. Q: What are the basics? mortar stores and moving online, while others like Lyft and GrubHub were born digital. Amazon’s latest foray into opening physical retail stores further indicates that humans desire experiences, and computers cannot create experiences, but only augment them. American Eagle totally missed the mark on what consumers want. At what point did we lose touch with the hierarchy of customer experience? At the bottom of the pyramid is the human-to-human experience. Whether you are a major brand or a startup, the basic tenet of what we do as humans for work is provide services and products invented by humans to other humans. This dates back to Mesopotamia when we first began farming and trading. The evolution wasn’t that humans stopped farming, it was adding in oxen to till rows that enabled humans to do more faster. The person who created the tools for the farmers was now an additional layer in the mix, but collectively it was from humans for humans. This continues to hold true today with all companies. Humans are creating things for other humans, and what’s crucial is the human experience. Although many elements are being automated, it’s still from one human to another in some capacity. If this basic level of the pyramid is not set up properly, the rest of the pyramid will fall. In this human-to-human level, channels such as email and phone are critical. Texting is becoming more prevalent, as this specific human-to-human interaction can be cumbersome to execute on mass scale. Texting allows for a truly human-to-human experience using a channel that lends itself to brevity. This may seem a little bit redundant to email, phone calls, and texts with customers, but it’s actually so important and distinguishably different so it needs another level on the pyramid. Once a product or service is purchased by a human from a human, the customer needs to be able to give clear feedback. Imagine walking into a clothing store to purchase something, and in the fitting room there’s no way to exchange a size or ask for help finding something new. This same basic experience is critical for companies of all sizes to master. By focusing on making it easy for customers to provide feedback, the product and the company will thrive with constant feedback and improvement. Sure, Facebook’s algorithms get messed up, and at times I’m angry that their stage for such sub-par products like chatbots is so large, but social is here to stay. And it’s not just Facebook. Snapchat proved that other players in the US can grow without Facebook buying them. And in Asia, there’s a bigger mix. From KakaoTalk to QQ, WeChat and LINE, a new crop of social apps and technologies are here to stay. Once your company has mastered human to human and a working feedback loop, it’s time to ensure that advocates have their own stage to promote your product or service. This stage has proven time and again that it does far more good than harm, and allowing advocates to speak goodness is always a great thing for your company. Start this year with a spring cleaning of your social channels. Ensure that all your social pages are cohesively designed, that you have a regular posting schedule, and that any two-way feedback (like that product feedback loop from above) is listened to, replied to, and documented. Q: What’s at the top of the pyramid? Alas, we finally made it to the top of the pyramid. This is where novelties such as chatbots, snapchat filters, and even contests and giveaways live. 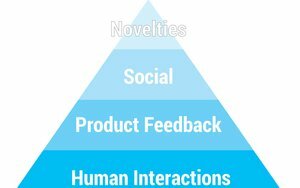 These are not critical to business, and even if they can be executed perfectly, without a solid foundation of human-to-human, product feedback, and social, your novelty execution may as well never happen. Some brands are finding that executing on novelty items is negatively impacting business and causing more harm than good. It’s important that as a company no more than 10% of your time is focused on these novelties. They tend to be shiny and new and enticing to spend time on. Ask yourself, “Is my pyramid solid?” before spending too much time on anything in the novelty category. Bots and AI seemed like the perfect solution in 2016 because Facebook announced them and it became an overnight sensation. Literally, there are more than a million bots wrongfully telling dumb jokes as novelties to try and point out that companies understand their customers. So far, chatbots have failed to deliver better customer satisfaction. This “quick fix” for providing a fake human-to-human experience to customers has resulted in a drop-off of 40% after the first text, and more than 80% of all consumers never use a chatbot more than once, according to Venturebeat. True human-to-human experience, however, like those that KLM has created — tying together all points of contact — are the opportunities most brands missed in 2016 and need to embrace in 2017. 1 comment about "Why Human-to-Human Contact Is Too Important To Pass ". Roy Moskowitz from Reciprocal Results, January 30, 2017 at 12:44 p.m. It would be nice if social media companies would provide human customer service, even for a fee. Currently known issues remain unaddressed and policy changes unexplained. Why not create a meta customer/tech/ support company for Facebook, Twitter, Google, Instagram, Pintrest, Tumblr etc, where users for a $20 month fee could access human (preferably US based) phone/chat/email support. The social media companies could pursue this as a joint profit center or I could start a Go Fund Me or Kick Starter Page or solicit venture capital.